In this episode, I had the pleasure of speaking with one of the world’s authorities on low carbon and smart city planning, Klaus Hoppe. I first met Klaus back in 2014 at the World Future Council Conference in Munich, where we were both speaking. Immediately, I was struck by his intense positivity and generosity of spirit. Whether he is talking about smart cities or waste management systems, Klaus speaks with the kind of infectious enthusiasm that makes any subject feel accessible. Klaus’s municipal career began in 1994, after he graduated with a master’s degree in geography with a special focus in city development. An aspiring urban planner even then, Klaus learned quickly that geographers were not highly sought after in the field. So instead, he found himself working for the city of Freiburg (a small but vibrant university town in South Western Germany) in their waste management department. There, Klaus began to develop an interest in waste legacies and sustainability in rural districts. From 2001 to 2014, Klaus led Freiburg’s waste management and energy departments, coordinating the city’s energy policies and strategies. Even though Klaus will tell you it was a team effort, Freiburg’s international status as one of the greenest cities in the world owes a great deal to Klaus’s vision and commitment to creating sustainable cities. Since then, Klaus has worked for the German Ministry of Research and has assisted the German government in developing several Sustainable Energy Action Plans and integrated city planning projects. In addition to the esteemed work he has done with his government, Klaus is an evaluator for the EU Horizon 2020 Smart City Programme and was a member of the Systemic Research City of Tomorrow. Currently, Klaus is an international consultant on smart cities and sustainable development strategies for municipalities, city networks, and national governments. And when he is not somewhere else in the world doing this incredibly important work, Klaus lives in Freiburg with his wife and two children. Craig Applegath: If you had the power to see one change, one innovation, or one policy implemented in cities around the world, that had the effect of significantly reducing CO2 emissions or helping cities adapt to climate change or helping cities repair environmental damage our species have already caused, or all of the above, what would it be and why? Klaus Hoppe: It would be the renaissance of the bicycle. I truly believe, I truly believe that the bicycle is one of the best inventions we ever had. These days, with the opportunity or the ability to increase our radius with electric bikes, which is happening in Germany already partly, and to produce to electricity we need 100% renewable. 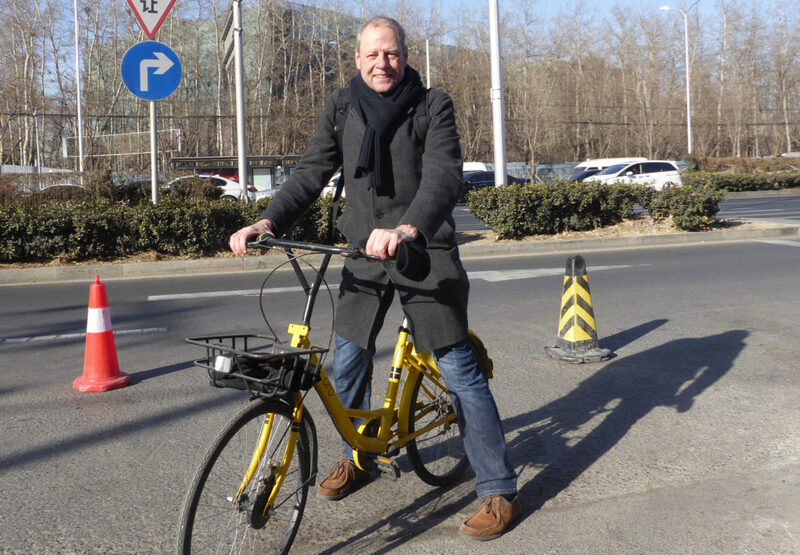 And to have the renaissance of the bicycle, especially in these Chinese cities where it was really accepted and now everything is car driving. And as well in our cities. I think this will be a huge change, or will lead to a huge change in our cities. Craig Applegath: And it’s something each of us could contribute to! Craig Applegath: Yeah, 500 meters is considered the maximum radius for a walkable community, so 5 kilometers makes sense for using bicycles. The second thing, which is much more legislative, and is a kind of an introduction of real CO2 emission, or energy fees, or you may call it tax, which is really, really internalizing the external costs. I’m not talking about CO2 trading. That’s not working. Forget about that at the moment. It’s not working in Europe, so they have to adjust it. It’s very difficult because there’s a lot of lobbyism. But if we put the real cost on the energy we use – and this discussion is happening in the states (I know that the Sierra Club was working on it). It’s happening in Germany, it still exists in Switzerland. It exists in the U.K., of course, much more to support the nuclear power, but it exists. And it exists in Sweden. So if we do that, we would have a dramatic change from fossil fuels to renewables, because they are just too expensive. Craig Applegath: Yes. I think that internalization of the externalities has got to be one of the most important things we have to somehow do. Klaus Hoppe: And you see, if we talk about local governments and the ability that I have as a human being, and the abilities that national governments have. This is a national government issue, and it needs courage, but it will work. It will work, from my perspective, because there are a lot of opportunities to arrange the system so that industry will not be affected in an absolute negative way. But we have to go in this direction. And I’m not a specialist, but I have the true feeling we have to go there. Taleb, Nassim N. The Black Swan: The Impact of the Highly Improbable. New York: Random House, 2007. Gigerenzer, Gerd. Risk Savvy: How to Make Good Decisions, 2014. Meadows, Donella H, and Diana Wright. Thinking in Systems: A Primer. , 2008. Highfield, Martin A. Nowak, and Roger. Supercoorperators: Altruism, Evolution, and Why We Need Each Other to Succeed. Free Press, 2012. Wilson, Jonathan. Inverting the Pyramid. A History of Football Tactics. New York: PublicAffairs, 2013. Goleman, Daniel. Focus: The Hidden Driver of Excellence. Bloomsbury, 2013. Florida, Richard. New Urban Crisis. Basic Books, 2016. Gehl, Jan. Cities for People. Washington, DC : Island Press, 2010. Macfarlane, Robert. Landmarks. Hamish Hamilton, 2015. “Our problems will not get solved by trying to solve them. But if we just observe, with a mind that is free from thoughts of resolution or escape, problems will disappear. In the obsessive search for a solution, each problem only gets bigger and more complicated. But, if we stop struggling, giving up our stubborn self-centeredness, the suffering vanishes and love is born. Meeting life shows that we can free ourselves from our problems by letting go all we know and pretend to be go and meditate – which means nothing more as to immediately let go all our wounds and fears, loneliness, despair and pain.